Meet the Sopranos of Afghanistan targeting the U.S.
A ruthless crime family reminiscent of a mafia film is emerging as the driving force behind large scale attacks throughout Afghanistan. Known as the Haqqani network, the group has reportedly built its reputation on drug smuggling, extortion and kidnapping for years. In the 1980s, the Haqqanis weren’t enemies of the U.S., but allies, as they fired CIA-provided missiles to strike Soviet planes over Afghanistan. 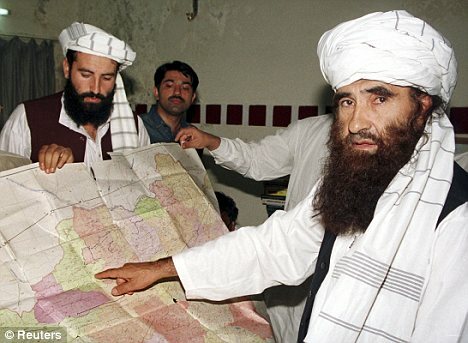 The group was founded by Jalaluddin Haqqani as a force designed to fight against the Soviets. Today, the 'family' is under the control of his son Sirajuddin, and is in the business of roadside bombs and deadly attacks on the U.S. 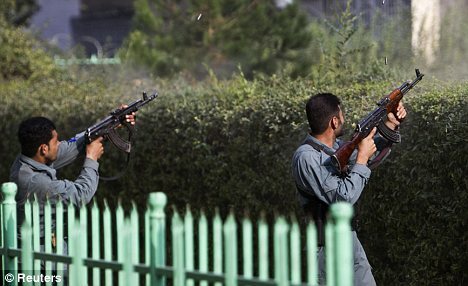 Most recently, the network was responsible for a 22-hour attack on the U.S. Embassy in Kabul, officials said. A Nato officer responsible for tracking the group told The New York Times that their brutal ways have picked up in recent years. He said: 'They will execute you at a checkpoint, or stop you and go through your phone, and, if they find you’re connected to the government, you'll turn up in the morgue. And that sends a message. 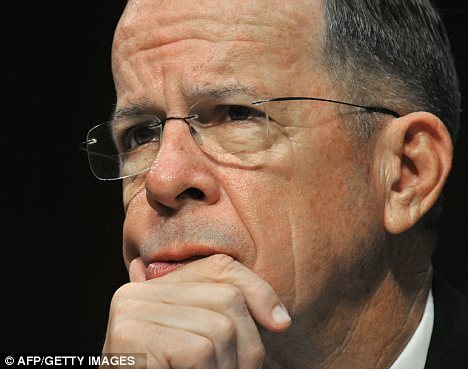 The Haqqani network is a 'veritable arm' of Pakistan’s ISI intelligence agency, which was in contact with the group of assailants in the Kabul embassy attack, Admiral Mike Mullen, chairman of the U.S. Joint Chiefs of Staff, told a U.S. Senate committee on Thursday. Senior Pakistani officials rejected Mullen’s allegations, and accused the U.S. of trying to make Pakistan a scapegoat for the war in Afghanistan. The public confrontation has plunged the already troubled U.S.-Pakistan alliance to new lows. Pakistan's leaders have shown no indication that they plan to act on American demands to attack the Haqqani network in its main base in Pakistan, even at the risk of further conflict with Washington. The U.S. has given Pakistan billions of dollars in military and economic aid, but the relationship has been sullied by mistrust. 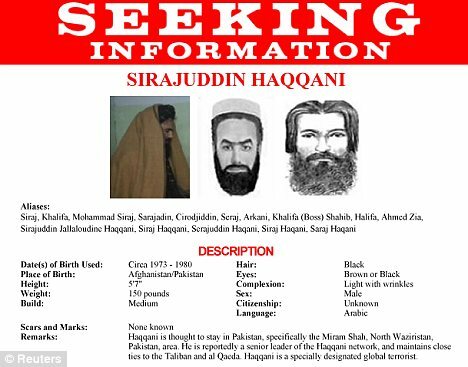 On Thursday, Sirajuddin Haqqani spoke to Reuters from an undisclosed location on Thursday, hours before Washington, ever more strident, accused Pakistan's shadowy but powerful ISI intelligence agency of working with the enemy. Pakistan's interior minister Rehman Malik rejected the accusations and warned against a unilateral U.S. ground attack on the Haqqanis, believed to be based in the mountains of North Waziristan. Malik said: 'The Pakistan nation will not allow the boots on our ground, never. Haqqani, the head of a group his father Jalaluddin founded in the 1980s, says he'd look forward to a U.S. ground attack. Still, he doesn't take chances, especially with drones overhead a constant worry - 57 drone strikes have peppered the region so far this year, according the New American Foundation, a think tank that keeps a database of such attacks. Some 55 members of his family, including his brother, have been killed in such attacks. According to the New American database, at least a quarter of drone attacks since 2008 have targeted the Haqqanis. He said that’s why he doesn't wear a turban - standard head-dress for all male Afghans - or carry a gun. Yet he is far from being a desperate fugitive on the run. He acknowledges that Haqqani fighters now number around 15,000, making it probably the largest force among the Taliban warlords. He also moves easily across the border to areas of eastern Afghanistan where the Haqqanis are entrenched. He even mediates disputes among the Taliban and takes part in their meetings in Afghanistan. ‘His word is enough,' said Mahmood Shah, a former Pakistan intelligence official who monitored militants for years. The forbidding terrain of Waziristan, which forms an ill-defined border with Afghanistan, is also his ally. 'There are certain houses and villages where the bathroom is in Afghanistan and the bedroom is in Pakistan and this creates some issues,' Malik said.